This recipe was a show stopper. It’s the only recipe for duck breast in the book, and that’s a real shame. Magret de canard is one of the staples of the Québécois culinary scene, a distinctive take on the seared duck breast is de rigueur for any restaurant interested in cuisine de terroir. Fusion may have been the dining buzz-word of the 90’s, but it’s certainly alive and well. It would seem that every third restaurant to open in the city has a _________ inspired menu playing on Québécois classics, most likely in tiny, tapas style portions. This Mexican influenced magret would fit in beautifully. 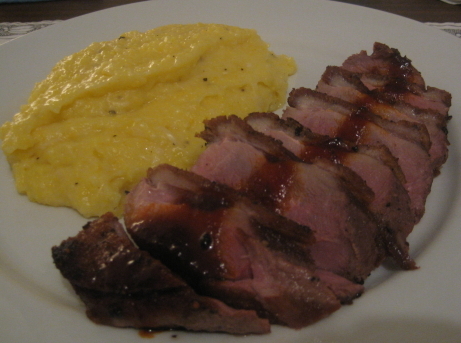 The duck breast is seasoned with salt and pepper, and simply seared. The skin renders enough fat that oil isn’t necessary. The sauce is made with a purée of Ancho chiles, and garlic which is added to a caramel of orange and lime juices, then finished with butter. The sauce had a lovely balance of sweet, acid, and heat, which complimented the powerful flavour of the duck. Duck does wonderfully with a slightly sweet sauce, and the orange caramel fit the bill, the rounded smoky Ancho flavour tempered the sweetness and played up the depth and body of the duck. Lots of people think they don’t like duck, and avoid it, or have only ever encountered it in Chinese preparations. A simply seared duck breast might be a revelation for them. My dining companion’s mother told us over dinner about her childhood experiences of eating duck. Apparently her family got it’s duck from local hunters, and they risked a mouthfull of buckshot with every bite. She recalls that it was too gamy and intense to be enjoyable, so she avoided it for the next twenty years, but these days she’s a fan. The duck we get today is raised on farms much like chickens, and the flavour appears to have mellowed. People deplore the fact that pork doesn’t taste like pork anymore, but no one complains that duck has lost its muskiness. I’ve never had duck from a hunter, but I’d like to compare some time. Looking at that beautifully pink duck breast is making my mouth water. It occurs to me though, that duck is the only poultry you’d ever consider cooking to less than well done. A medium-rare chicken breast brings on gasps of revusion, not delight. Duck really does taste best when pink though. If you’ve never tried a magret de canard I absolutely encourage you to, and the sauce The Book has paired with this one is a wonderful compliment. I loved that the sauce showed off everything I enjoy about duck breast, without trying to show it up. Duck Breasts with Orange Ancho Chile Sauce you’ve earned your five mushroom rating. That duck was dang delicious! Yup, thinking about this dish has convinced me we need to have duck again soon. Wow! I made this last night and it is fabulous. I had a moment of panic when I looked through my selecion of dried peppers (all 12 kinds or so) and discovered that I was ancho-less. I was sure I had some and after further investigation I found that they had fallen out of my chile bag. Whew! I think that sauce would also go well with pork or chicken. You’re right the sauce could be fairly multipurpose, you might even serve it over grilled vegetables. I guess you could use another smoked pepper if you happened to be a ancho-free. The anchos are nice because they have such mild heat, but so much depth and background, but I think you could substitute without throwing the recipe out of balance.